Anxiety nursing diagnosis is defined as Vague uneasy feeling of discomfort or dread accompanied by an autonomic response (the source often nonspecific or unknown to the individual); a feeling of apprehension caused by anticipation of danger. It is an alerting signal that warns of impending danger and enables the individual to take measures to deal with the threat. Anxiety disorders are the most common mental illness in the U.S., affecting 40 million adults in the United States age 18 and older, or 18% of the population, according to the National Institute of Mental Health. In fact, anyone from all walks of life can suffer from anxiety disorders. It affects the poor, the rich, the young, the old, the sick, the healthy, and more. However, everyone experiences anxiety differently. It can be a result of fear, uncertainty, circular and racing thoughts, and the avoidance of certain behaviors. It can affect our ability to function normally, and even convince us that we’re losing our minds. And worst, it can even lead to related psychological conditions, like substance abuse and personality difficulties. The reality is that many people struggle with anxiety. Thus, it’s important for health care providers and the patient to understand what anxiety he or she is suffering from and how it affects him or her. Patients can and do overcome anxiety if they stick with cognitive strategies and practically apply them to their lives. Anxiety is characterized by the following signs and symptoms. Use these subjective and objective data for your Anxiety care plan under the assessment column. Patient describes own anxiety and coping patterns. Patient demonstrates improved concentration and accuracy of thoughts. Patient demonstrates ability to reassure self. Patient maintains a desired level of role function andproblem-solvingg. Patient monitors signs and intensity of anxiety. Patient identifies strategies to reduce anxiety. Patient identifies and verbalizes anxiety precipitants, conflicts, and threats. Patient demonstrates return of basic problem-solving skills. Patient demonstrates increased external focus. Patient has vital signs that reflect baseline or decreased sympathetic stimulation. Patient has posture, facial expressions, gestures, and activity levels that reflect decreased distress. 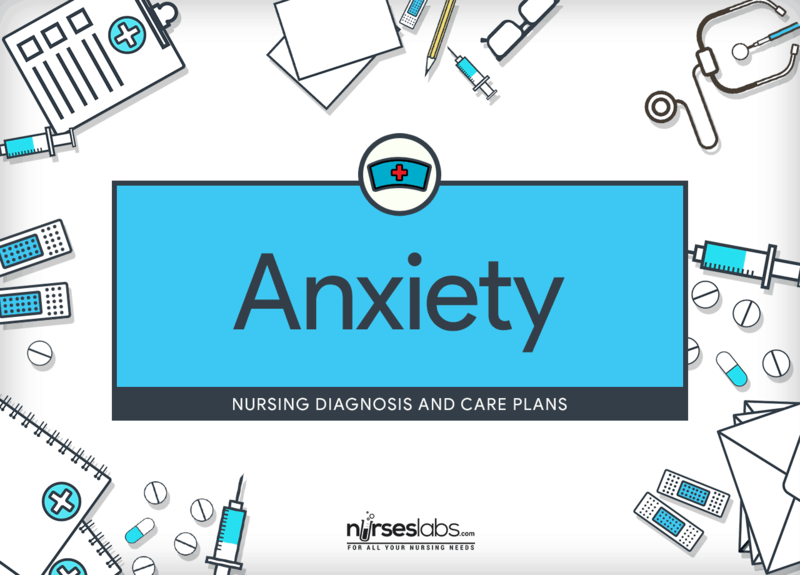 Assessment is required in order to distinguish possible problems that may have lead to Anxiety as well as name any episode that may happen during nursing care. Assess for the presence of culture-bound anxiety states. The context in which anxiety is experienced, its meaning, and responses to it are culturally mediated. Assess the patient’s level of anxiety. Hildegard E. Peplau described 4 levels of anxiety: mild, moderate, severe and panic. The patient with mild anxiety will have minimal or no physiological symptoms of anxiety. Vital signs will be within normal ranges. The patient will appear calm but may report feelings of nervousness such as “butterflies in the stomach.” The patient with moderate anxiety may appear energized, with more animated facial expressions and tone of voice. Vital signs may be normal or slightly elevated. The patient may report feeling tense. With severe anxiety, the patient will have symptoms of increased autonomic nervous system activity, such as elevated vital signs, diaphoresis, urinary urgency and frequency, dry mouth, and muscle tension. At this stage, the patient may experience palpitations and chest pain. The patient may be agitated and irritable and report feeling overloaded or overwhelmed by new stimuli. In the panic level of anxiety, the autonomic nervous system increases to the level of sympathetic neurotransmitter release. The patient becomes pale and hypotensive and experiences poor muscle coordination. The patient reports feeling completely out of control and may display extremes of behavior from combativeness to withdrawal. Assess for the influence of cultural beliefs, norms, and values on the patient’s perspective of a stressful situation. What the patient considers stressful may be based on cultural perceptions. Assess physical reactions to anxiety. Anxiety also plays a role in somatoform disorders, which are characterized by physical symptoms such as pain, nausea, weakness, or dizziness that have no apparent physical cause. Validate observations by asking patient, “Are you feeling anxious now?” Anxiety is a highly individualized, normal physical and psychological response to internal or external life events. Use the State-Trait Anxiety Inventory to differentiate between the patient’s anxiety level as a temporary response state and a long-standing personality trait. The State-Trait Anxiety Inventory, developed by Spielberger, is considered a definitive tool for measuring anxiety in adults. The tool is written at the sixth-grade reading level and is available in more than 40 languages. Observe how the patient uses coping techniques and defense mechanisms to cope with anxiety. Asking questions requiring informative answers helps identify the effectiveness of coping strategies currently used by the patient. This approach may help the patient feel like he or she is contributing to patient care. Coping strategies may include reading, journaling, or physical activity such as taking a walk. Defense mechanisms are used by people to preserve the ego and manage anxiety. Some defense mechanisms are highly adaptive in managing anxiety, such as humor, sublimation, or suppression. Other defense mechanisms may lead to less adaptive behavior, especially with long-term use. These defense mechanisms include displacement, repression, denial, projection, and self-image splitting. Recognize awareness of the patient’s anxiety. Since a cause of anxiety cannot always be identified, the patient may feel as though the feelings being experienced are counterfeit. Acknowledgment of the patient’s feelings validates the feelings and communicates acceptance of those feelings. Use presence, touch (with permission), verbalization, and demeanor to remind patients that they are not alone and to encourage expression or clarification of needs, concerns, unknowns, and questions. Being supportive and approachable promotes communication. Familiarize patient with the environment and new experiences or people as needed. Awareness of the environment promotes comfort and may decrease anxiety experienced by the patient. Anxiety may intensify to a panic level if patient feels threatened and unable to control environmental stimuli. Interact with patient in a peaceful manner. The nurse or health care provider can transmit his or her own anxiety to the hypersensitive patient. The patient’s feeling of stability increases in a calm and non-threatening environment. Accept patient’s defenses; do not dare, argue, or debate. If defenses are not threatened, the patient may feel secure and protected enough to look at behavior. Converse using a simple language and brief statements. When experiencing moderate to severe anxiety, patients may be unable to understand anything more than simple, clear, and brief instruction. Reinforce patient’s personal reaction to or expression of pain, discomfort, or threats to well-being (e.g., talking, crying, walking, other physical or nonverbal expressions). Talking or otherwise expressing feelings sometimes reduces anxiety. Lessen sensory stimuli by keeping a quiet and peaceful environment; keep “threatening” equipment out of sight. Anxiety may intensify to a panic state with excessive conversation, noise, and equipment around the patient. increasing anxiety may become frightening to the patient and others. Help patient determine precipitants of anxiety that may indicate interventions. Obtaining insight allows the patient to reevaluate the threat or identify new ways to deal with it. Allow patient to talk about anxious feelings and examine anxiety-provoking situations if they are identifiable. Talking about anxiety-producing situations and anxious feeling can help the patient perceive the situation realistically and recognize factors leading to the anxious feelings. If the situational response is rational, use empathy to encourage patient to interpret the anxiety symptoms as normal. Anxiety is a normal response to actual or perceived danger. Recommend patient to keep a log of episodes of anxiety. Instruct the patient to describe what is experienced and the events leading up to and surrounding the event. The patient should note how the anxiety dissipates. Recognition and exploration of factors leading to or reducing anxious feelings are important steps in developing alternative responses. The patient may be unaware of the relationship between emotional concerns and anxiety. If the patient is comfortable with the idea, the log may be shared with the health care provider, who may help the patient develop more effective coping strategies. Symptoms often provide the health care provider with information regarding the degree of anxiety being experienced. Encourage the patient to consider positive self-talk like “Anxiety won’t kill me,” “I can do this one step at a time,” “Right now I need to breathe and stretch,” “I don’t have to be perfect.” Cognitive therapies focus on changing behaviors and feelings by changing thoughts. Replacing negative self-statements with positive self-statements aids to reduce anxiety. Consider the patient’s use of coping strategies that the patient has found effective in the past. This enhances the patient’s sense of personal mastery and confidence. Avoid unnecessary reassurance; this may increase undue worry. Reassurance is not helpful for the anxious individual. Assist the patient in developing new anxiety-reducing skills (e.g., relaxation, deep breathing, positive visualization, and reassuring self-statements). Discovering new coping methods provides the patient with a variety of ways to manage anxiety. Intervene when possible to eliminate sources of anxiety. Anxiety is a normal response to actual or perceived danger; if the threat is eliminated, the response will stop. Assist the patient in strengthening problem-solving abilities. Highlight the logical strategies that the patient can use when experiencing anxious feelings. Learning to identify a problem and to evaluate the alternatives to resolve that problem helps the patient cope. Explain all activities, procedures, and issues that involve the patient; use nonmedical terms and calm, slow speech. Do this in advance of procedures when possible, and validate patient’s understanding. With preadmission patient education, patients experience less anxiety and emotional distress and have increased coping skills because they know what to expect. Uncertainty and lack of predictability contribute to anxiety. Instruct the patient in the appropriate use of antianxiety medications. Short-term use of antianxiety medications can enhance patient coping and reduce physiological manifestations of anxiety. Drugs in this group work through enhancing the action of the inhibitory neurotransmitter gamma-aminobutyric acid (GABA). These drugs are recommended for short-term use, not to exceed 3 to 4 months. Physical dependence and tolerance are problems associated with prolonged use of these drugs. This drug has fewer side effects and less risk for dependence than the benzodiazepines. The drug has a slower onset of action and may take 1 to 2 weeks to produce a noticeable therapeutic effect. Several drugs in this group have been approved by the Food and Drug Administration (FDA) for use in the management of panic disorder. Their use in treatment of other types of anxiety is being investigated. Beta-blockers are effective in managing the physical symptoms of anxiety that occur with the social phobias (e.g., stage fright). The alpha-2 agonists are used to manage anxiety associated with withdrawal from nicotine and opioids. Tell the patient to limit use of central nervous system stimulants. Stimulants (e.g., caffeine, nicotine, theophylline, terbutaline sulfate, amphetamines, and cocaine) can increase physical symptoms of anxiety. Provide massage and backrubs for patient to reduce anxiety. This aids in reduction in anxiety. Provide patients with a means to listen to music of their choice. Music is a simple, inexpensive, esthetically pleasing means of alleviating anxiety. Rule out withdrawal from alcohol, sedatives, or smoking as the cause of anxiety. Withdrawal from these substances is characterized by anxiety. Educate patient and family about the symptoms of anxiety. If patient and family can identify anxious responses, they can intervene earlier than otherwise. Teach patient to visualize or fantasize about the absence of anxiety or pain, successful experience of the situation, resolution of conflict, or outcome of procedure. Use of guided imagery has been useful for reducing anxiety. Teach use of appropriate community resources in emergency situations (e.g., suicidal thoughts), such as hotlines, emergency rooms, law enforcement, and judicial systems. The method of suicide prevention found to be most effective is a systematic, direct-screening procedure that has a high potential for institutionalization.